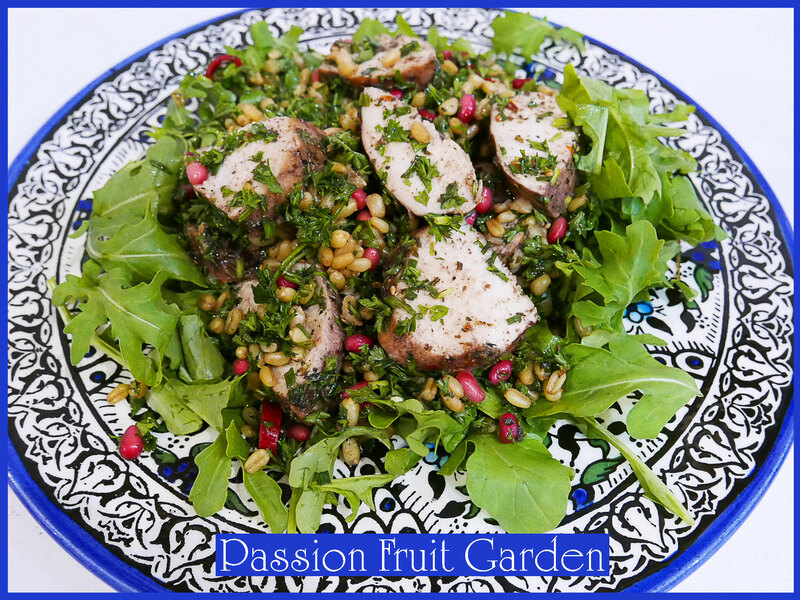 Here is another recipe from my current favourite book, Palestine on a Plate, by Joudie Kalla. I noticed the recipe a while ago and parked it. Then, the other day, when I was thinking, “What’s for dinner?”, it sprang forth. It is very simple but it does take about 30 minutes to cook the freekeh so allow yourself sufficient time. I am a real fan of freekeh but we don’t eat it often enough. As a consequence, there was a packet in the pantry getting precariously close to its use-by date. Coincidently, we also had abundant pomegranates, mint, parsley and chives so the recipe was a perfect choice. There was not much on the shopping list. The recipe as published (and as set out below) is supposed to feed four. I guess it just depends on how much chicken you like. We usually eat one breast between two of us. I used one large breast and made about a third of the marinade, ie, 1 teaspoon of dried mint, 1 teaspoon of za’atar, etc. I roughly halved the salad ingredients. What constitutes “a large bunch of parsley”, “a bunch of chives” and “a bunch of rocket” is anyone’s guess. As it turned out, the quantities I chose were perfect for us. The top photo, which was half of what I made, was just right for one. Work out how much chicken and how much salad you think you will need and adjust the recipe accordingly. If you like to eat grains (we all should) and haven’t tried freekeh, give it a go. It is very nice. I find it similar to brown rice. For those who don’t know, freekeh is roasted green wheat grain. *These are 15 mil tablespoons. Boil the freekeh in a saucepan of salted water for about 30 minutes. Remove the pan from the heat, drain and then leave the freekeh to cool down slightly. Preheat the oven to 190°C with fan . Put the chicken in a bowl and add the dried mint, za’atar, chilli flakes, pomegranate molasses and a drizzle of olive oil and season with salt and black pepper. Mix to ensure it is all coated. Tip the chicken out onto a baking tray, pouring over any excess juices from the bowl as you do. Bake for about 20–25 minutes until cooked through. Slice the chicken into strips. Add the parsley, spring onions and chives, red chilli and pomegranate seeds to the freekeh and mix together. Mix the dressing ingredients together, adjust the seasoning to your liking and toss over the salad. Sit the salad on a bed of rocket and then top with the sliced chicken and its juices.